VRARA Italy Chapter hosted a dinner for the VR/AR Association Milan’s Chapter. At the event there were present both members and enthusiasts about the association, coming from a wide range of industries, all sharing the passion for Augmented and Virtual Reality. It hasn’t just been an opportunity to meet each others and to consolidate ties and relationships among members, but also a moment to discuss goals and proposals of the Association’s Milanese Chapter for the upcoming year. The Italian VR/AR ecosystem is becoming everyday more and more solid, with startups and companies among the most valuable in the italian and international landscape. One of the things we are most proud of is the heterogeneity of our members, which includes specialists from the most diverse sectors: from edutainment to gaming to the enterprise, from software development to sound design/engineering for this new way of experiencing reality. We are sure that such a multitude of diverse professionals can only provide a solid foundation for the growth of the network. We are enthusiastic about how the event has been perceived and how people from such different backgrounds have been able to find themselves united by the passion for these emerging technologies. The next VRARA event will be launched in Milan/Italy soon, contact us if you want to get in touch with the association or if you’re interested to join our next gig! More pics from the dinner event here. 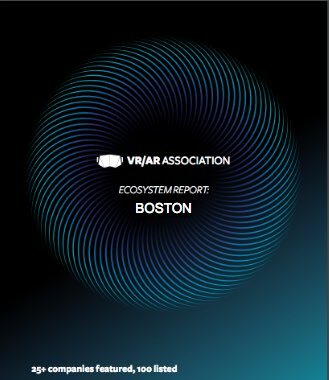 VRARA's 50+ Chapters are producing industry reports on the regional VR/AR ecosystems to promote companies and organizations involved with immersive technologies and media from NYC to Sydney, across the world. The reports will be promoted by VRARA and our partners reaching potentially a 1M audience. We have discounted passes and exhibit discounts for VRARA Members. EICS Summit is 2 days of conferences on XR technologies, innovation and creativity. Keynotes, speeches and networking inside the charming Venice Casino. 16 top speakers from the worlds of "Architecture, Art and Design", "Entertainment", "Healthcare" and "Industry 4.0". EICS Summit is not a fair and not a show. This is not another gaming event, here we approach business. EICS is built up and studied to involve the most important companies, professionals and investors working on new technologies. The VR/AR Association (VRARA) is an international organization designed to foster collaboration between innovative companies and people in the virtual reality and augmented reality ecosystem that accelerates growth, fosters research and education, helps develop industry standards, connects member organizations and promotes the services of member companies. The VRARA has 4000 companies and 15000 professionals registered and over 50 global chapters, 20 of which are throughout Europe. VRARA’s programs are designed to help anyone accelerate their growth, knowledge, and connections. Talent Garden operates every day to create local, vibrant campuses that empower digital tech communities and connect them globally. Through its coworking spaces, its training programmes and a variety of different events, TAG helps the community of explorers and innovators to flourish and grow. Dedicated to tech and digital professionals, our coworking spaces features a number of unique concepts designed to support innovation, including smart workspaces, “fab-labs”, relaxation areas, TAG Cafés, event spaces, meeting rooms and classrooms. TAG Innovation School is an educational institute aimed at supporting individuals and businesses to grow and lead in an increasingly digital world. It offers a variety of courses, bootcamps, Masters Programmes and executive training programmes. At Talent Garden we moreover organize a series of networking activities and events, ranging from community meetups to corporate gatherings, with the common objective of promoting and celebrating innovation. Last week VRARA staff and members took part at one of the most exciting VR AR events in Italy. The event was full of keynotes, panels and workshops from the most influent professionals of AR | VR | AI | Robotics scene, both Italian and international. This posed as a great chance to look around and put the hands on the newest technologies and approaches, as the venue was full of companies and startups showcasing their products, both Software and Hardware. The affluence to the event was incredible, a lot of people flooded the hall costantly throughout all the duration of the event, there were mostly professional looking for solutions to innovate their business, as it was the event’s topic, but we also met tech-enthusiasts and developers among the crowd. The event was a success from all the points of view, and everyone who tried our products and demos was really impressed about how Augmented Reality technology can really simplify work operations like maintenance, training and remote support. Kris gave a keynote speaking about the ecosystem. VRARA has over 3900 companies registered and it's almost a 50/50 ratio of VR to AR companies, many of which do both, VR and AR. Among the vast number of speakers, Mauro Rubin, JoinPad CEO, went onstage to describe the Smart Factory of the Future, from the perspective of a company actively working to bring enterprises in the future through Augmented Reality. He described 2017 as the year of AR, pointing out that the innovation is coming by the application of this technology in the enterprise sector, where it can provide the most tangible added values. During the presentation Mauro explored the topic through a series of industrial use cases where Augmented Reality has been applied. Each use case explained a different approach to the implementation of AR into enterprise operations to help different industrial sectors leverage the potential of their workforce, enhancing the perception of employees in the work-field. This exploration covered a wide range of opportunities given by AR to enable the interaction between the user and his working environment, from the interaction with IoT connected machines to Artificial Intelligence and complex systems. This served as a starting point to understand how an AR platform can transform a normal factory into a Future Smart Factory. At the show were present several companies, each one with a different focus but all aimed to create new business opportunities, from training VR applications to collaborative and smart Robotics. Looking from the inside we believe that the AR/VR/AI/Robotics ecosystem in Italy is still affirming, but we’re pleased to see that a lot of new players decided to become involved in this new fields. During the exhibition, JoinPad CTO, Giuseppe Audino, was called to join the jury of a Call for Ideas promoted by PwC Italy, the competition wasn’t focused only on Augmented Reality, but in all the four themes of the event. Lot of interesting projects from italian startups and independent developers were submitted to evaluation, but just five gained the opportunity to end up in front of the jury, that judged Metaliquid solution as the best project running for the contest. This was a good signal of how fast this ecosystem is evolving in our country, gaining everyday more popularity and widespread, with ever increasing attention from big companies that more now than ever recognize the value of new technologies and seek for new projects to foster under their wings. As an expert in Augmented Reality and Interaction Design, Agnese Ragucci, JoinPad designer&developer, described the trail of Augmented Reality Games in a timeline retracing their evolution through technologies, devices and examples. Starting from the early 00’s she narrated the history of this kind of games, focusing on the most important titles and the technology involved in their usage. She also described how certain strategies and techniques were employed to encourage the mass-adoption of AR technology, and then determined the success of some of the most played AR Games. The second part of the speech was dedicated to forecasts and insights about the future of both AR and Gaming, describing how they are evolving in parallel to deliver ever more immersive experiences to the player, using technologies as Context Computing, Artificial Intelligence and new devices available on the market. The speaking session received a lot of attention, especially because is a fact that gaming is one of the driver of AR massification. Our business partner, Ginwa, joined the event as speaker. Ivan Cui, president of iGinwa, the technological division of the corporate, discussed about the AR/VR scene in the eastern market, exploring topics such as hardware production, startups and investments. He also pointed out that the ecosystem in China is in its early stage, encouraging western startups to jump in and blend with the local ecosystem of investors and accelerators. Peggy Yuan, Senior Investment and Program Manager of HTC Vive X Accelerator in Beijing, met the local VR and AR developers in a closed-door meetup, seeking for interesting startups to begin a conversation with, but also giving advices about the HTC acceleration program. She went in contact with several enterpreneurs and enthusiast, giving hints and insights about HTC latest products and platforms, and showcasing different startups under the Vive X Accelerator. As supporting partners we were in charge of different internal meetups and side events. Through the VRARA, Google Engineer Piotr Praczyk, from the ARCore development team, were invited for an in-depth analysis of Google newest AR technology, generating a lot of interest in the more technical audience of the event, with a lot of developers participating to test demos and ask questions to the professional. We also held a meetup with the VRARA to create a conversation among different Chapter Presidents, with Mauro Rubin representing the Milan’s Chapter of the Association, helping both newborn companies and well-established ones to understand the possibilities of the VRARA to leverage their businesses. At the Meetup there were present, beside Mauro, three other representatives of the association: Kris Kolo – VRARA Global Executive Director, Miki Levy – Tel Aviv Chapter President and Thomas Fickert – Munich Chapter President. If you need more information about getting involved with VRARA, contact us. We’re looking forward to join the next year’s edition, as already said this year’s event has been a success in all of its parts, both from the commercial side of the exhibition to the more eye-opening side of keynotes, panels and workshops. Eagerly waiting for the next year’s event, we want to thank anyone who joined us in this beautiful experience, with a particular thank to Talent Garden Italy, for the flawless organization and Marcello Merlo as the curator of the event.